What are the benefits of trusted advisor involvement during family firm succession? And what are the risks? Succession is one of the most important but also most difficult parts in the family firm lifecycle. No wonder that many family firms build on the help of external trusted advisors such as lawyers, accountants or bank advisors, to help them managing the succession process. But what are the risks of such involvement? Under what circumstances are advisors beneficial and when are they detrimental? In our conceptual paper my co-author Alexandra Michel and I investigate this phenomenon in a paper forthcoming in Journal of Family Business Strategy. In each of the phases, the trusted advisor can support the succession process by sharing information (“reducing information asymmetry”) and by mediating conflicts. Moreover, the advisor can contribute important process-and task-related knowledge. For instance, s/he knows about typical time frames, best practice solutions, etc. However, in each of the phases, the trusted advisor can also hinder the succession process. This happens when s/he doesn’t equally distribute the information (but prefers one of the parties), if s/he is unable to mediate conflicts, or if s/he is too much focus on own agenda (e.g., neglecting emotional aspects and focusing on the “rationally” best solution). 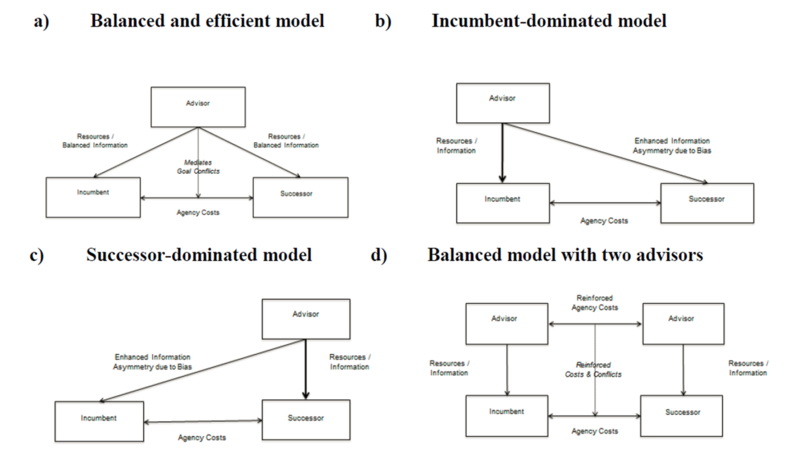 A constellation with two (or even more) advisors does not solve the above mentioned problems of trusted advisor involvment but even makes them worse (see also Figure 2). A. Michel, N. Kammerlander. Forthcoming. Trusted Advisors in a Family Business’s Succession-Planning Process — An Agency Perspective. Journal of Family Business Strategy.